This is generally a place I can comment and rant about anything that takes my fancy but more especially related to Bath (Somerset, UK), Beer, Pubs, Brewing, Food, Recipies, PubCo's (Pub owning Property Companies) and other injustices. Brexit and the Tories - In a Democracy you can change your mind. For the last 4 years we have been condemned to discussing and mithering about, ranting and raving over a question we should never have been asked. The Cameron government decided that the best way to deal with the annoying buzz of the Eurosceptics in the Tory party was to take, what was assumed to be a non question, to 'The People'. What has followed as all now know has been a complete disaster, akin to throwing our country under a bus. To my utter disgust I now hear that the one MP with the least understanding of real peoples lives, one Jacob Rees-Mogg, has changed his mind about Theresa May's 'deal'. 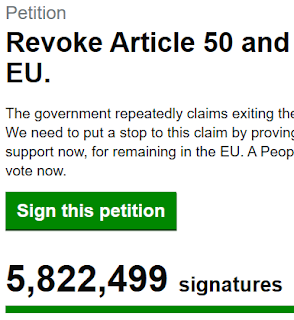 Last night the Government Petition Site sent an email to all 5.8+ million petitioners the standard verbal about why it won't agree to another popular vote. Apparently 'we the people' aren't allowed to change our minds. I thought we lived in a democratic country but it seems this is an illusion wheeled out to suit. In a democracy you can change your mind. What has 'reduced confidence in our democracy' is the blinkered approach with which the PM has pursued her 'deal' to the point of her own destruction. It is that that is the current cause of 'reduced confidence in our democracy'. 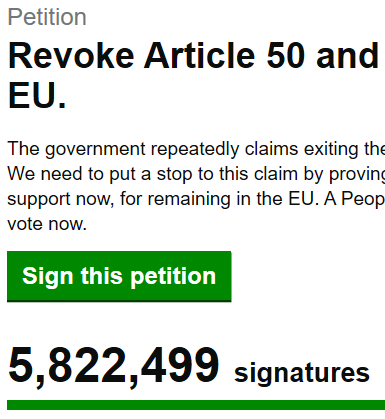 The damage that this farce has and will continue to do to public trust will take a whole generation to repair, and then only if a government is scrupulously honest and fair with all it citizens. The Tories will never be that. As I type I'm aware that the day's news will be filled with a long list of options to discuss a way forward now that the Tory party has surrendered its role as the governing party in the UK. Tomorrow sanity may have returned and we'll get an apology for the cost and destruction of real peoples lives that has ensued from David Cameron's vanity. Perhaps when I wake I will find it was all a very bad dream. Probably the most significant changes to my life was during the last quarter of 2013. I applied for a post in a new team. I was finally interviewed and appointed in the spring of 2014. Since then my feet have barely touched the ground. If anyone follows me on Twitter (@thenctoo) they will know that I have erred toward the quick and dirty world of ambiguity to speak of whatever drives me at the time. Again this summer we went off to Penzance in Cornwall for a week and extended weekend to help celebrate the Summer Solstice in the Golowan Festival (Pretty naff and out of date). They have a Facebook page too - https://www.facebook.com/pages/Golowan-Festival-Official-Page/277967782386. 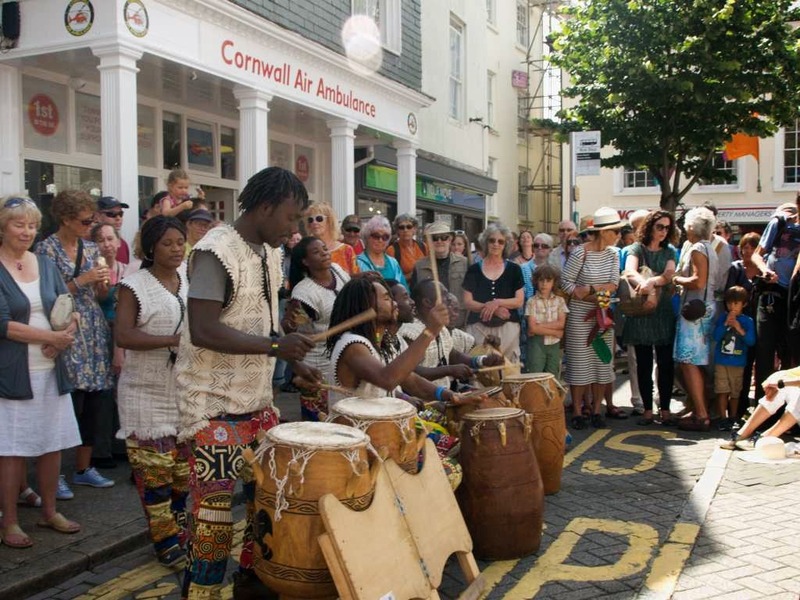 Every summer the people of Penzance and Penwith mark the Solstice with a week or more of Arts events, showcasing the best and variety of the Arts in the far South West of Cornwall. 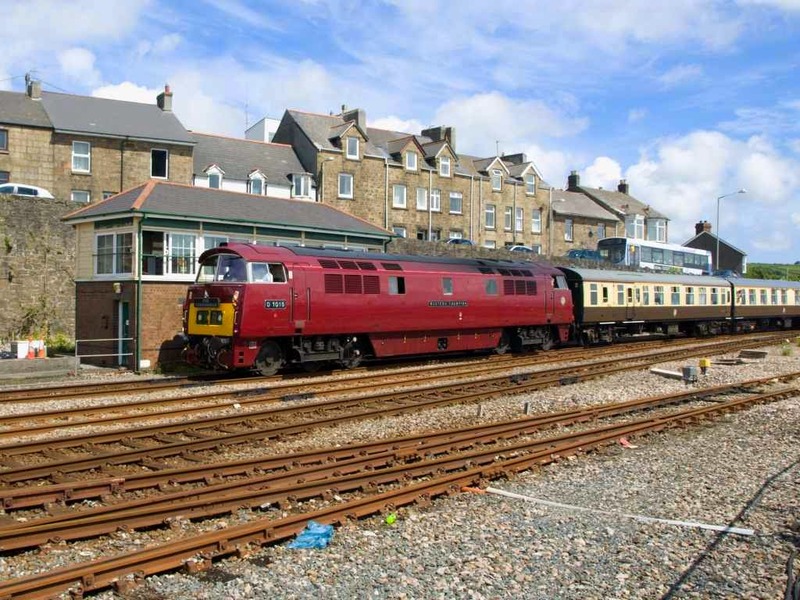 One of the high points for me was the arrival of the Mazey Day Cornishman special train hauled by preserved diesel hydraulic locomotive D1015 Western Champion. The celebrations culminate in two festival days. 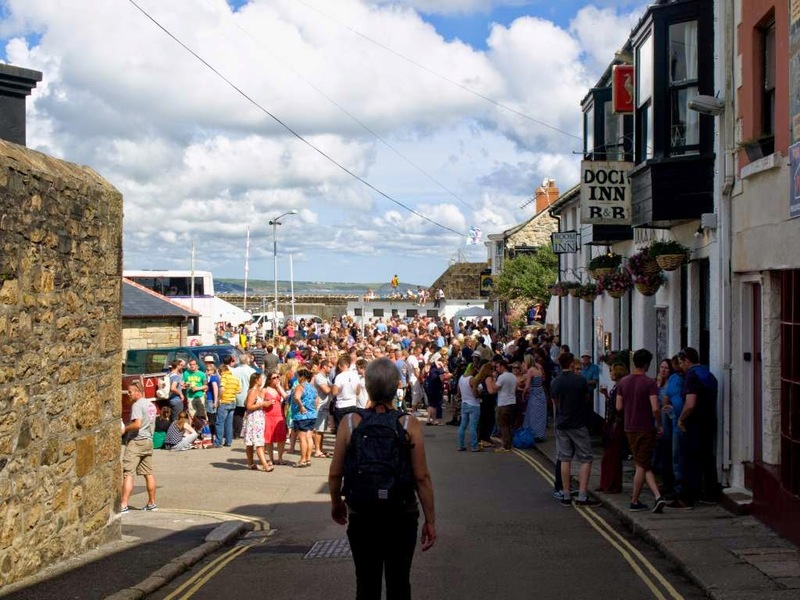 On the Saturday the town of Penzance enjoys Mazey Day and is given over to the procession of schools and community groups showing of their themed creations. Despite there being barely 40 thousand people living in Penwith they have to hold 3 processions as it's not possible for all the groups to be paraded at once. As well as the parades there are stalls and entertainments as well as a considerable amount of drinking. 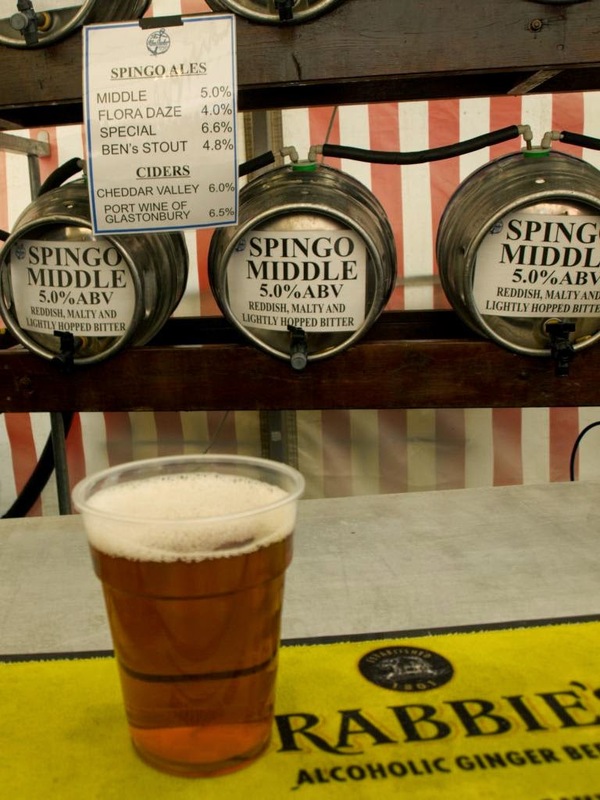 One of the high points for me this year was the Spingo tent. It was delight to see so many of their brews in one place. Probably the only time it happens outside Helston. 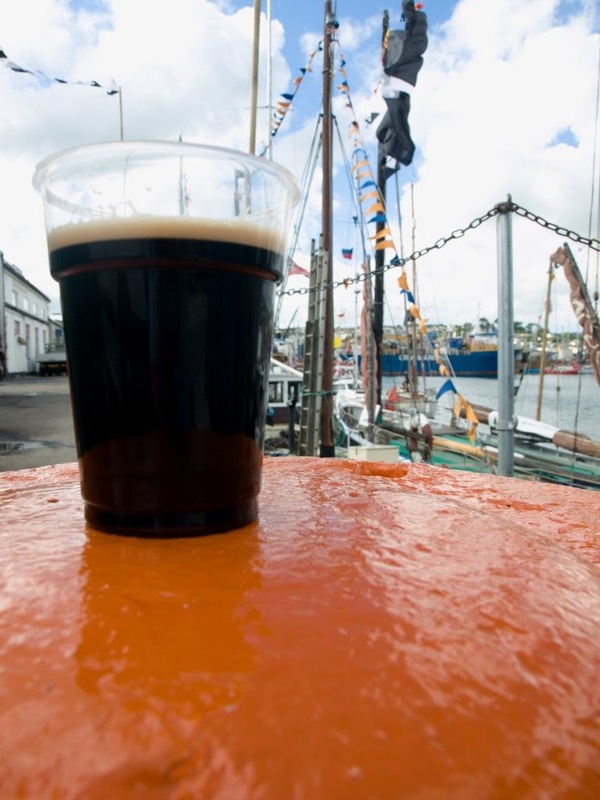 On the following day the town celebrates Penzance Quay Fair Day with stalls, entertainments and more drinking. Hello again to all my readers. I suspect that all my readers are Search Engines trawling through all the Blogger pages. As a reintroduction of interest in these pages I am writing a brief chronology of the past year or so. 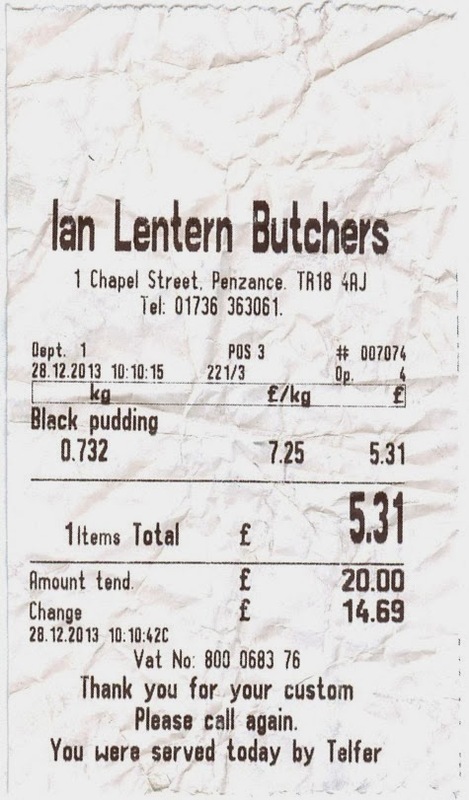 During our stay over Christmas in Penzance we had the opportunity to visit the Ian Lentern Butchers shop for a couple of bits and pieces to feed us over the holiday period. When I first entered the shop I was impressed by the well displayed meats and uncluttered space. 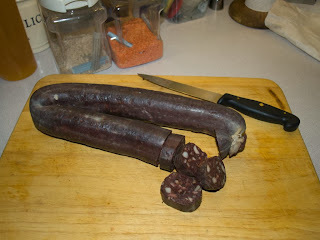 At the far end was the chilled cabinet containing the cooked meats and the initial object of my interest, Black Pudding. Yes, I know Cornwall has a reputation for first rate Hog's Pudding but if anyone knows me or has followed this blog for a while they'll know that I'm always keen to try different black puddings from all of the country. 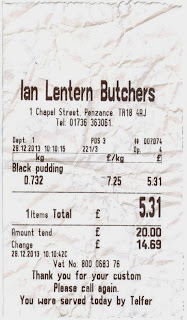 So, for a little less than a pound I purchased a short length of Black Pudding to have with my breakfasts for a few days. Lentern's Black Pudding is delicious. It is certainly not a very black pudding due in the main because of its natural skin. Cutting a 12mm slice I found it to be firm and retained its structure. The contents were well defined. Blood, barley and fat are in appropriate proportions and the aroma was enticingly savoury. The pudding's consistency was not over compressed and crumbled slightly when cut. 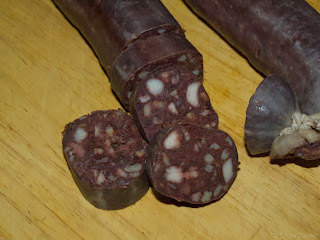 Finally the taste; Lentern's Black Pudding is as the aroma suggested, savoury without being over spiced, seasoned with salt the pudding had a richness which demanded a fresh slice of buttered toast to gain the best from it. I enjoyed the pudding so much I resolved to purchase a whole one which I did on our way to the station, bound for home. A whole pudding weighed just 732g and at £7.25 per Kg cost £5.31. It is now sliced and frozen for me to enjoy with breakfast and the occasional lunch for the next couple of months. The journey down from Bath was gloriously uneventful. Barring the unfortunate child 3 seats back, bored literally to tears, who boarded the train with us in Bath and at St Austell left us to enjoy the final few miles. 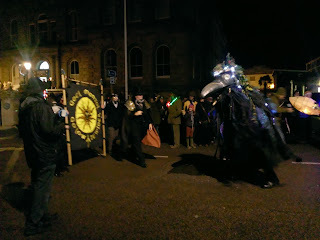 With the dubious Christmas songs from further down the carriage, we ran down from St Erth and in to Penzance. 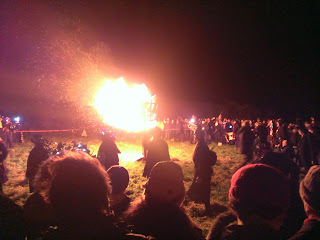 Montol on December 21st is a recently revived festival of the Winter Solstice. 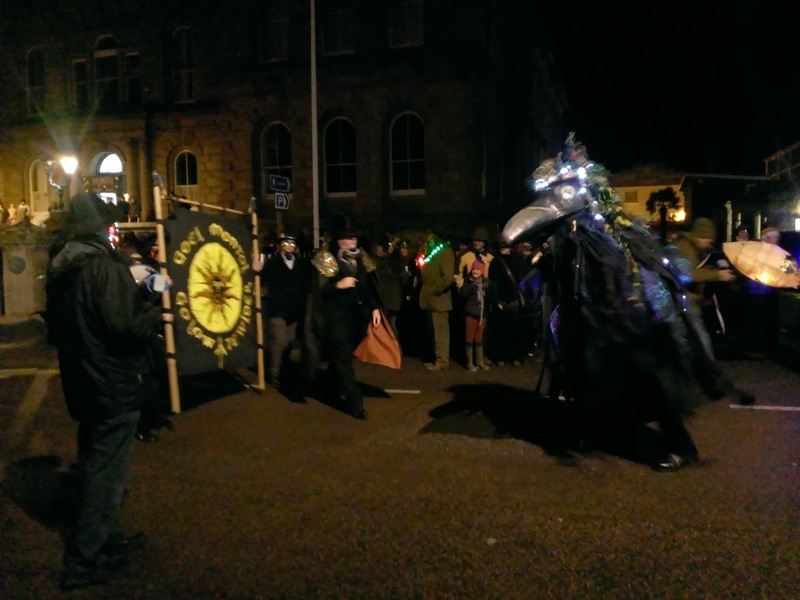 We joined the parade up to the prehistoric Lescudjack Hill Fort where the 'Lord of Misrule' lit the beacon fire an dances were performed. With a gale of some 40 mph blowing the dry timber in the beacon didn't last long before being blown through the lee of the basket. The walk back down to town was a much less ordered affair and we left the group at Leskinnick Street to enjoy a fine pint of the Cornish Crown Brewery's Porter in the Crown. Tum-tee-tum - Heavens - Do I have a blogspot? For no other good reason than, Site Meter has reminded me that I have a fallen readership (5 hits last week), I am writing these few words to wake up the search engines to the fact only checking back once per day is probably not sufficient, should I recommence my pursuit of literary fame. Needless to say, Twitter seems to have attracted me away from the more formal blogging in favour of random 140 character 'tweets' with the monicker @thenctoo. In a vague attempt to push my total hit count up from the current 9066 to a 5 digit number, I feel perhaps I'll pursue this writing thing a little further. 'First thing' became ‘nearly lunch time’ and our planned trip to Town to buy a replacement for the ageing Chinos that had failed me last night started late. The first and last shop we went to was Burton's and there it was that I discovered that there is no longer a 'standard fit' that I'll ever get in to. It took 3 changes of trousers of various descriptions to realise this. I don’t shop for clothes well and three changes were trying my patience. Why aren’t companies making trousers for men of my shape? I know it’s a sizable market because I see them in pubs wherever I am. How hard are short and pot belly sized trousers to make? I eventually left Burton's in a pair of jeans 2 inches larger in the waist than my M&S Chinos and 2 inches longer in the leg to boot. As we walked down a damp Market Jew Street I realised that the legs were far too long to be practical. We swung left down New Street prompted by an ‘A’ board inviting us to an ‘All Day Breakfast’, then left again into Princes Street for a 'proper' breakfast which we found at Country Cousins Café (there’s bound to be a story behind that name). The Café is a wonderfully traditional cafe serving everything with chips, toast or fried bread and pots of tea. The search for a seamstress began following breakfast and was concluded when Wonder Web was purchased in the Sewing and Craft shop where we'd enquired after a seamstress. Quick bit of shopping in the Co-op and back to the 'self-catering' to iron in the Wonder Web ready for our day's adventure (Coronation Street on TV and is winding me up). 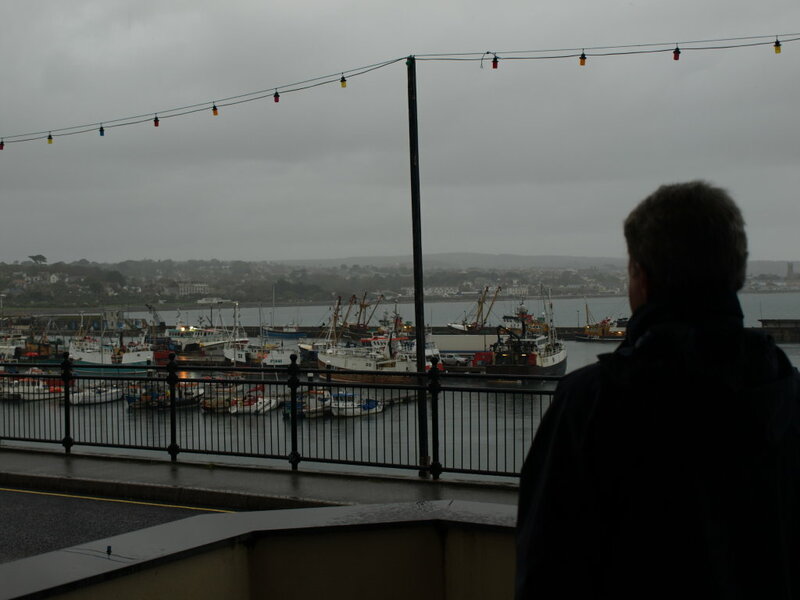 Plan - get to The Fisherman's Arms before the forecast rain arrived. The reason I wanted to visit The Fish, as the regulars have it, was that I had met a man from Newlyn called Perren in The Coeur de Lion in Bath and had been advised to visit the pub and say ‘hello’ to Brian his father. It was a pleasant walk we took down the back lanes to the Boating Pond before strolling along the seawall into Newlyn, past The Tolcarne Inn, through the village past the fish docks and up the hill towards Mousehole. 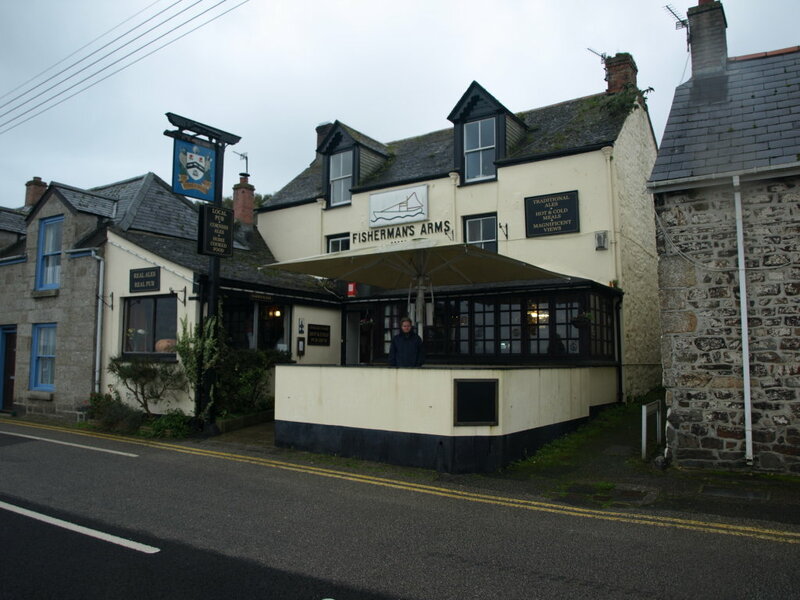 The Fisherman's Arms is a revelation of local community togetherness. Quite apart from the atmosphere the beer was the trustworthy Trelawney and Proper Job from St Austell Brewery. Closed from 4-6 Monday to Thursday 'out of season' it was a delight as every conceivable inappropriate comment could be squeezed out of today's Daily Mail. Raw and hilarious, we and the pub were in stitches. 4 o'clock came too soon and as we left, the rain established itself for our walk back to The Red Lion. Its only 50 yards way and we were already wet as we entered. We were customers 2 and 3 and ordered Addlestones Cider and Dartmoor Brewery's Jail Ale. After acquainting ourselves with the pub cat (Milo?) and this week’s copy of The Cornishman we started back toward Penzance. A quick detour left off the main road took us through a collection of lanes, unreachable with Google Earth, which proved to be a delight to us both, before coming out by the Swordfish Inn. Across the road and thoughts of chips entered our conversation, ”If I can see a 'chippy' from over here we'll nip back for some”. Alas the wooden buildings by the Fisherman's Mission obscured my view back up The Strand. Turning and walking back toward the Penzance road there it was in all its delicious signage, 'Fish and Chips'. The smell of fresh cooking oil and batter met us as we entered. At the top of the Menu on the wall was Fish of the Day £3.70. As soon as we were asked, I quickly responded with "Fish of the Day please, with Chips". "What fish?" the girl replied. "Fish of the Day" I repeated. I didn't mind what it was but after a dig in the ribs I realised there was a choice. We could have had Scallops or John Dory and even Lemon Sole 'huge ones'. Embarrassed I chose the Lemon Sole. Once it was cooked and packed with salt and vinegar we left the shop with several “Cheerios”'. 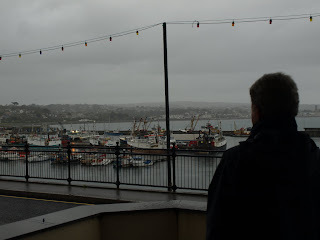 The rain was coming down in buckets as we walked back round by The Tolcarne Inn toward the seawall I tore open the paper wrapping the food and we got stuck in to beautiful chips. After a few mouthfuls and while the rain began to wick its way up our trouser legs we grinned at each other and walked on. Having made some space in the styrene tray, the golden batter on the sole was beckoning. With an inviting crunch the batter gave way to the most delicious Lemon Sole I have ever eaten. It just oozed essence of sea with every bite of the soft white flesh. Soaked and in taste heaven we smiled our way along the seawall toward the bottom of Alexandra Road. The kettle went on as soon as we could get across the living room without tramping rain across the carpet. Wasn't that a day and a half!! Public Service Vehicles - Neither 'Public' nor 'Service'!! BT Openreach - Neither open nor reachable!! Terrorism? - Over 10,000 Americans are killed every year in the USA - by Americans with guns. The older I get, the angrier I get. The angrier I get, the older I get! !